South Africa’s Zuma survives renewed calls to resign – Royal Times of Nigeria. South African President Jacob Zuma survived fresh calls within the ruling African National Congress party for him to resign, party officials said today, as they acknowledged support was “drifting away” from the movement. Senior figures in the ANC met over the weekend after Zuma endured months of criticism over his sacking of respected finance minister Pravin Gordhan. ANC secretary general Gwede Mantashe said that the meeting had not backed the resignation demands, and had instead discussed “the need to reconnect with sectors of society that are drifting away from the movement”. A string of ANC allies have also urged Zuma to go; including the Congress of South African Trade Unions, the South African Communist Party and the South African Council of Churches. 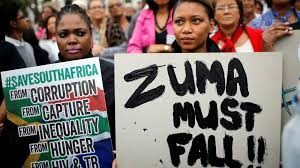 Zuma has faced widespread public anger over a series of corruption scandals, record unemployment and a sluggish economy.